The return of the beautiful Countess Olenska into the rigidly conventional society of New York sends reverberations throughout the upper reaches of society. Newland Archer, an eligible young man of the establishment is about to announce his engagement to May Welland, a pretty ingenue, when May's cousin, Countess Olenska, is introduced into their circle. The Countess brings with her an aura of European sophistication and a hint of scandal, having left her husband and claimed her independence. Her sorrowful eyes, her tragic worldliness and her air of unapproachability attract the sensitive Newland and, almost against their will, a passionate bond develops between them. But Archer's life has no place for passion and, with society on the side of May and all she stands for, he finds himself drawn into a bitter conflict between love and duty. 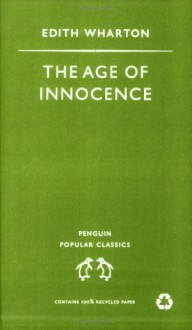 In the course of reading "The Age of Innocence", I sometimes just forgot that it plays in the late 19th century, because its plot and main characters somehow seem to fit contemporary views just like they would 19th-century morals. I truly enjoyed Edith Wharton's novel and ironic style of writing.